Medium size bathroom is easy to design and falls into the most common bathroom type. 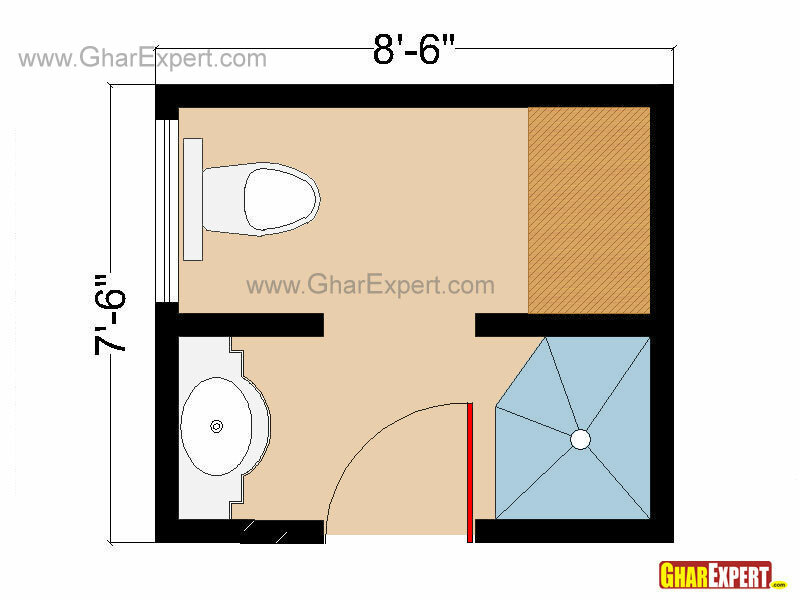 Area for medium bathroom floor plan is around 61 square feet to 100 square feet. Apart from basic fixtures, you can have a corner shower bath, single bowl vanity unit , Wall cabinet for bathroom toiletries in medium spaced bathroom. Bathtubs and vanities are available in various sizes; please ensure the available space before buying. 1. Bathtub: Standard dimensions are 5ft x 2-1/2ft. You can also find bathtubs of 5.6ft x 3ft. 3. Vanity Sinks are 1.6 to 2 feet wide and 1.4 to 1.6 feet from front to back. Vanity sink cabinets are about 2.5 feet high and 2 to 3 feet wide. 4. Toilets or WC: Standard seat width used is 1.3 feet. Seat lengths vary from 1.5 to 1.6 feet. Proper toilet seat dimensions should have height of 1.3 or 1.5 feet. 5. 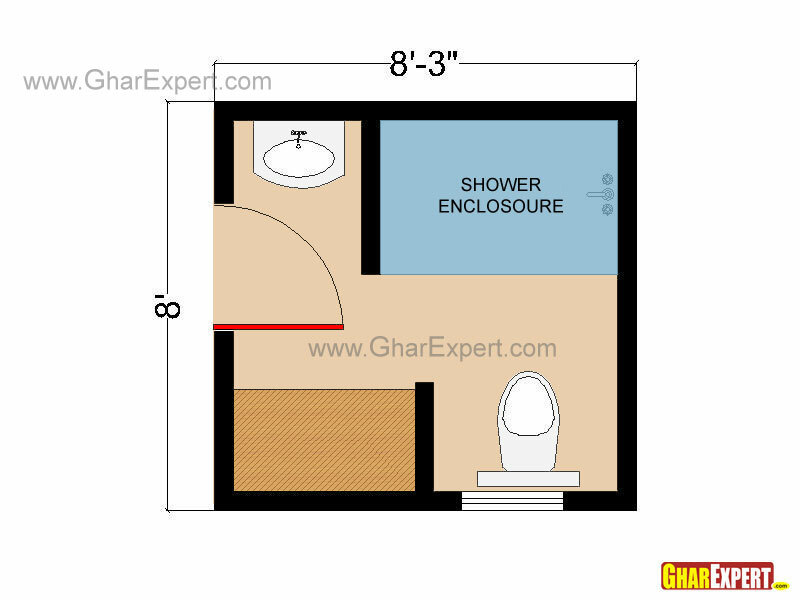 Corner Shower Enclosure: Standard dimensions of corner shower enclosure is 3 x 3 feet and 6 to 7 feet high. 6. Shower Cabinet: Minimum dimensions for shower cabinet is 3 D x 5 W x 6 H feet and maximum dimensions depends on space available. 7. Bathroom Cabinets: Standard width is 2 feet. Length of cabinet depends on space available. In medium bathroom floor plans, we start with some three-quarter bathroom layouts. 1. If you are sharing one bathroom, this floor plan may help you. Use of pocket door adds feature of privacy and use of bathroom at its fullest. Dimensions: 8'-6"x 7'-6" feet (63.75 sq feet). 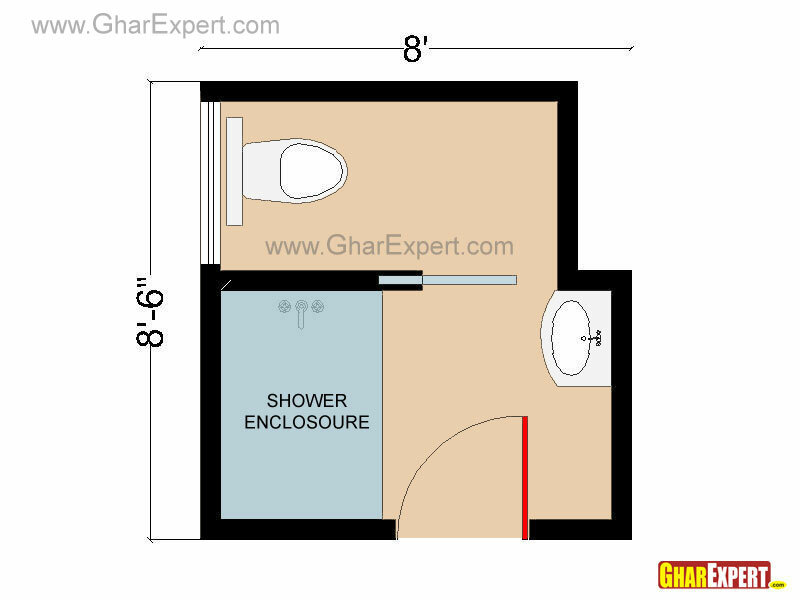 A bath vanity,shower enclosure,toilet and cabinet can easily fit in 63sqft bathroom with dual door. You can use it as attached master bathroom or common bathroom. Sliding or pocket door in middle of bathroom gives you more privacy and two person can use it at a time. Option: You can accommodate a storage space for towels at the place of one door . 2. This floor plan of bathroom, somehow similar to above layout except doors. It has single door. Fixtures: Shower enclosure, sink vanity, toilet and wall cabinets for storage. Perfect layout for master bathroom. Privacy walls for toilet area. 3. If your bathroom is not perfectly square or rectangular, no need to worry. This floor plan is best for bathrooms having coat closet or invaded in parts because of structure beams. Dimensions: 8'x8' feet (64 sq feet). Single door, window with sink vanity, toilet and shower enclosure. Options: 1.You can replace shower enclosure with bathtub. 2. Addition of towel bar near toilet adds comfort to bathroom. 4. Next bathroom plan gives you some extra space for large bathtubs or whirlpool tubs. Whirlpool tubs add luxury to bathroom. Dimensions: 8'-9"x7'-6" feet (65.62 sq feet). Generous space for large bath tub. Large window for natural light and ventilation. Corner space near toilet can be utilised for decoratives or corner vanity. 5. Few more feet gives you space for wall cabinets. You can easily store towels or other accessories in cabinets and make your bathroom neat and clean. Dimensions: 8'x8'-3" feet (66 sq feet). Enough space for shower enclosure and wall cabinet. 6. 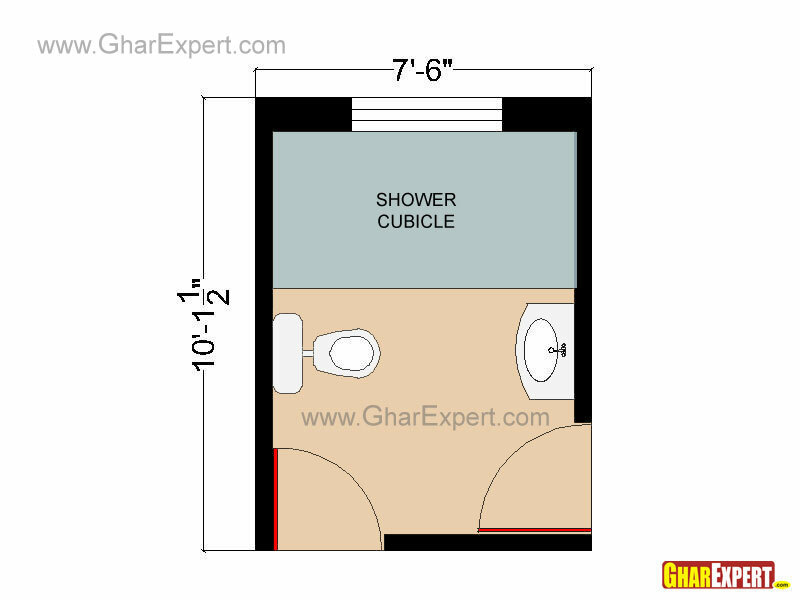 68 sq ft is enough space for sink, toilet and shower enclosure. It easily fulfills the requirements of a master bathroom. Dimensions: 8'-6"x8' feet (68 sq feet). Easily accessible from two rooms, perfect layout for shared bathroom. Generous space for shower envlosure. Pocket door adds more privacy to bathroom. Placement of sink in both sections make this layout more functional. 7. 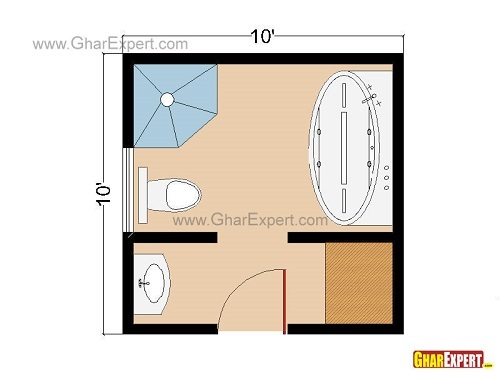 This bathroom floor plan is similar to above plan, except doors and its shape. Use of pocket door offers more privacy and comfort. 8. A Full bathroom accomodates a shower enclosure, bathtub, sink and toilet. This layout add more comfort and luxury to bathroom. 9. This plan offers you extra 4 feet. But more space is occupied by doors. Two doors are good in bathroom layout are good, if you are sharing your bathroom. Dimensions: 10'x7'-6" feet (76 sq feet). Generous space for shower cabinet. Two doors make this bathroom layout accessible from two rooms. 10. If you have budget, this is nice floor plan for full bathroom. It offers you clear area in center with all necessary fixtures. Fixtures: sink vanity, toilet, shower enclosure and large bathtub. Generous clear area in center for dry of or wash off. Perfect layout for luxurious master bathroom. 11. 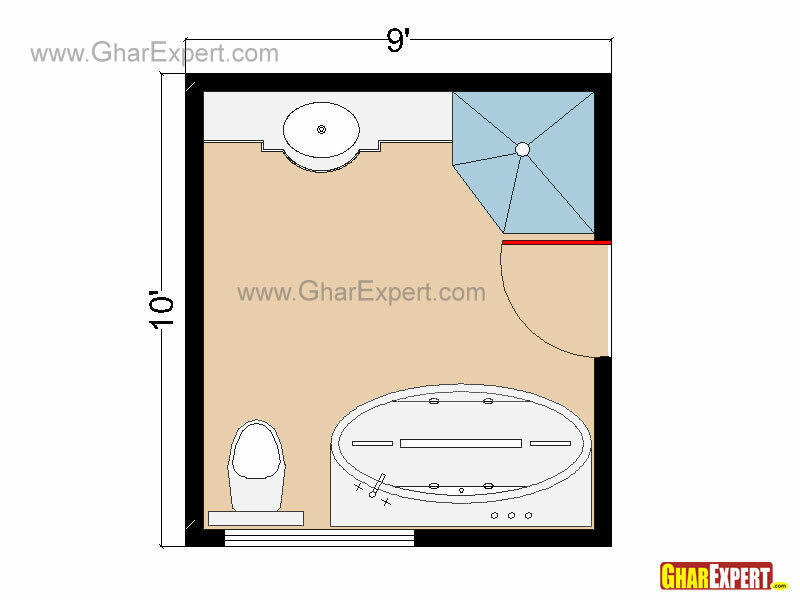 Normally bathroom is rectangle in shape, if your bathroom has “T” like shape then this floor plan is good choice. You can place towel bar near the bathtub and use wall space near toilet for cabinets or any other purpose. 12. Last but not the least, another layout for medium bathroom. 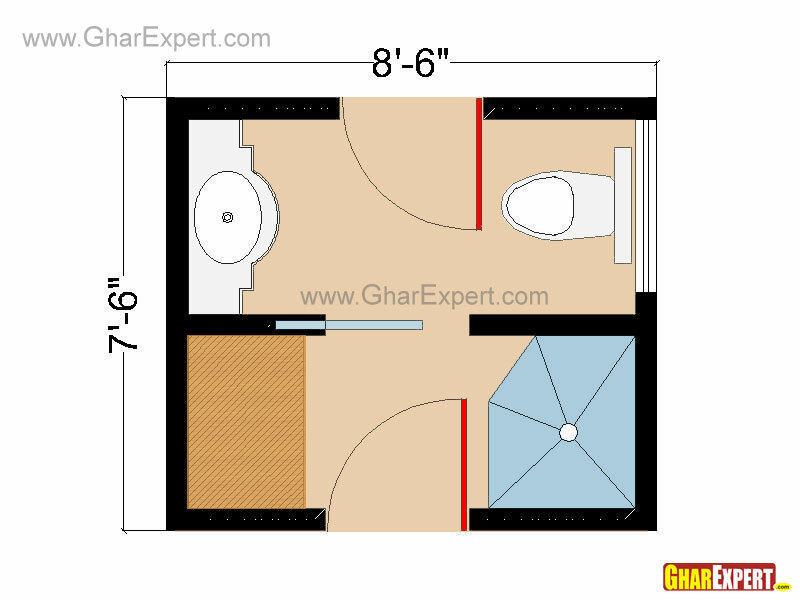 100 square feet is quite enough space for luxurious master bathroom. Fixtures: Sink, toilet, Shower enclosure, bathtub and cabinets. Privacy walls for bathing area.